I have a problem…. I made turkish delight using a recipe exactly like this one, When I dusted it in the icing sugar/cornflour mix, the turkish delight kept ‘sweating’ so now I just have lots of shiny turkish delight with lots of rose-flavoured icing around them! I have decided just to coat them all with chocolate instead, but what did I do wrong??! I had the same problem when I put my turkish delight made from this recipe in a plastic container. A couple of helpful tips – firstly, make sure you turn out the turkish delight onto a surface dusted in icing sugar, or it might end up glued to it! Secondly, store the turkish delight in a container lined with greaseproof paper, and leave it sat in the icing sugar mix used for dusting. This should absorb the ‘sweating’ and stop it sticking. Hi Anon. Cup sizes are actually a standard volume measurement (particularly in America) – I’m not using one I’ve picked out of the cupboard at random! Long story, but it’s from when the settlers were moving into remote areas and couldn’t afford the space and weight on their travels that a set of scales would take up; they’re useful when you’re cooking because you can operate by volume rather than by weight. The cup in question is the same size as a traditional English teacup – if you have an old Wedgwood, Royal Doulton or similar service in the family with teacups and saucers, they’ll be exactly the right size. You can also buy standard measuring cups in any cookery shop (some come in sets so you have dinky half-sized cups as well so you don’t have to guess at measurements in recipes which call for half or third cups). This is a very useful set of cup volume/weight conversions if you don’t have a suitable measuring cup. 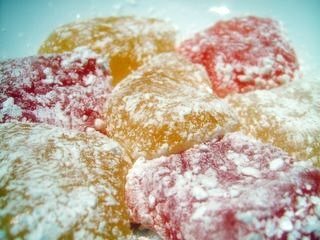 Hi there, I would like to make Turkish delight as a present for a friend – How long can it be stored for & how should it be stored? Please can you tell me how long the Turkish delight will keep for, roughly speaking? Hi Tori – it should keep for about a month, although you’ll notice a bit of a texture change as it dries out over that period. Thanks for visiting! i do not have a sugar thermometer but figured i would know when the soft ball stage was occuring, however, my mixture turned very dark very quickly and turned into caramel, how do tou know when its at the right temperature without a suger thermometer? 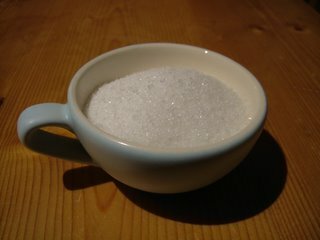 The way they used to do it was to get a bowl of cold water and drop small amounts of the sugar mixture in it to test. I’ve seen someone place their hand in ice water until they can’t stand it and then grab the hot sugar with their bare hands and put it back in the ice water. You must be quick though. When you can roll the sugar mixture into a ball and it is soft you are there. apart from a minor accident where i spillt all the rosewater all went well. Made some last night, mine really condensed and only managed to make enough for half of what is listed so I may double it next time… but then I may end up with way too much….. what am I talking about! you can't have too much!!! It's GORGEOUS! I've never liked it until now! So glad you liked it so much – it's *loads* nicer when you make it yourself! I just made this turkish delight. but a problem arose. After I had combined the sugar syrup and the flour/cream of tartar paste and stirred for only 15 minutes it had already turned a honey colour and also was thickening up so much it was very hard to keep stirring. It also tasted really good and felt, in my mouth, like the right consistency (if slightly softer than the cooled version would be). I stopped cooking it and poured and set it. what is the problem with cooking it for such a short time? and is there a risk of overcooking it if I just keep up the heating and stirring beyond the honey coloured stage? I wondered if this indicates i had overcooked the sugar in the first place. The sweating is really a problem! … all to no avail. I'm starting to wonder if I'm cursed! I doubt the tropical climate I currently live in has anything to do with it, as the store bought ones I get don't sweat. I'm starting to suspect witchcraft. I find that when I made hard candies, they would become sticky if I took the sugar off the heat too early. This is why a sugar thermometer is good, and I suspect this might be why you get the 'sweating'.. I have never made turkish delights, but I just thought I'd let you know..
by the way, 1 cup = 240 ml. It's much easier than trying to convert a volume to weight. And easier to calculate with when fractions are used. 1½ cup = 360 ml. It's even easier if someone who's doing the recipe weighs their ingredients and tells us the weights for the dry ingredients 😛 Then I'd have less worrying and less washing up to do, and could have measured the ingredients into the pan quicker. Honestly, the amount of cornflour in a cup varies fairly significantly depending on how packed it is and how filled the cup is. Do you fill it to rounded, like with teaspoons? Do you fill it to level, like with level teaspoons? Do you fill it as much as you would fill it with tea? Great recipe. Too bad most of the essences available in my country seem to have artificial colours or flavours. I found rosewater essence, owing to its clear colour, fit the criteria. But I wanted to do strawberry, and perhaps a lemon or lime. If you hail from Australia too, make sure you read the side of the Queen “natural” flavouring essence they sell in supermarkets if this is the brand you find. A few of the flavours are indeed natural, but seemingly most have propylene glycol and a raft of three digit artificial colours. There’s no distinction on the packaging, they are all labelled “natural”. There is another range of “imitation” essences that Queen carry, not sure what they put in those if this is their definition of natural. Could you clarify something for me please? By “essence of rosewater” do you mean attar of roses (the pure form, which is not easy to find) or rosewater (the dilute form, which just about every Asian food shop stocks)? It makes quite a difference! Hi Anon – yes, the dilute form. Those labelled “essence of” in the UK are actually distilled from the petals; labelling laws here mean that things called just “rosewater” may not actually contain any actual rose at all. Hi, Whenever I have bought Turkish Delight in a Turkish Supermarket they have allways coated it in Ground coconut and very delicious it is too. I tried to make this one without cream of tartar. Thought that just will put more lime juice and citric acid. But while sugar was boiling I was making water+cornstarch. But in this proportion (1 vs 3) I get just white water. May be cream of tartar make it more “thick, gluey paste”. So nothing again. I will try again with gelatin. Hi, I made a mistake when making my turkish delight tonight. I forgot to bring the sugar to soft ball stage. I added my sugar mixture to the cornstarch which was really thick on the stove. It had a few lumps I stirred it as much as I could but just left it, hoping the lumps will cook out. 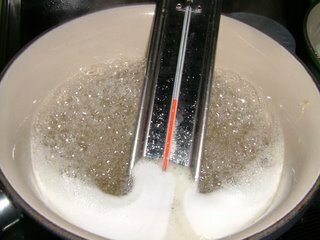 I cooked gently for one hour but it never reached desired temp on a sugar themometer only 140degrees Farenheit. However it did thicken considerably so that it was difficult to stir it was definetely not pourable. 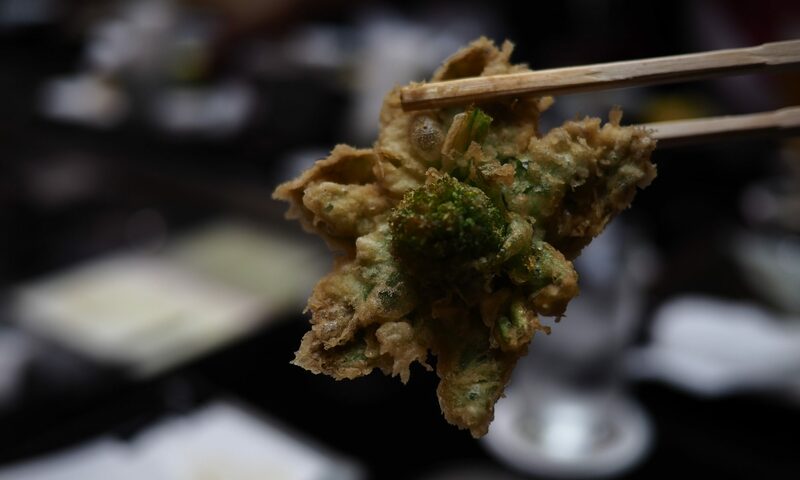 Consistency was very thick without too much noticible lumps and seemed like the real texture. I scooped it into a tin and am presently waiting for it to cool and see if it is any good. My question is, does it need to reach soft ball stage temperature to be turkish delight? Ah no – 1 cup = 250 ml this is the standard size. We use it in Australia, and I have American & European recipes that I have converted all with this standard & no failures yet. & yes – the English stand is also 250ml for 1 cup. Can I suggest that there are some really cute cup measures at Kitchen stores & department stores [the one that starts with a K or T even] and this takes the guess work out of it all. Mine looks like a matriuska doll and has the measures nested inside each other. I get my rosewater & orange flower water from a Persian deli/specialty store where it is really inexpensive – but it the best you can get. But most health food stores have it here too. I wonder if you could also use pomegranate to flavour the TD?